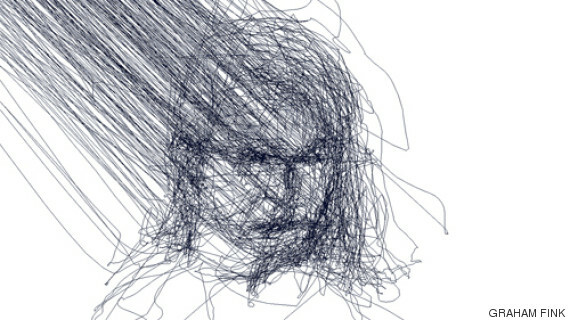 Artist Graham Fink draws haunting portraits using only his eyes. "I basically draw the lines in my mind and see what develops on screen," he told The Creators Project. "Sooner or later a face will appear. You have to really trust your unconscious that the image will materialize." "It's kind of like digital charcoal in a way," he added. Fink said he got his inspiration from art teachers who once exhorted him to look harder as he worked. "Trouble is, there is a lot of process going on between your eyes looking at something and then transferring that information to your brain, down your arms, through your pencil and onto the paper," he said in a statement. "I thought, wouldn't it be wonderful to draw directly using just my eyes."